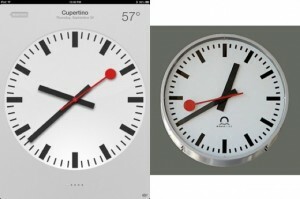 Apple faced some problems with Swiss Federal Railways as it filed a case against Apple over copying its Icon Clock design in Apple’s iOS 6 which was released during last month. This led to increase pressure on Apple as it is already facing some other important issues over the release of its new iPhone 5 mainly included are disturbing maps and podcasting problems. Now, after three weeks, Apple has finalized the deal with Swiss Federal Railways in order to continue using the clock icon on its mobile devices. According to a press release, the Swiss Federal Railways SBB and Apple have reached and inked an agreement on the use of the SBB station clock icon on the devices of the Apples including iPad and iPhone. During this press conference, the terms of the agreement were not mentioned.